Amira Hass is a reporter and columnist for Ha’aretz Daily, a newspaper based in Tel Aviv, Israel. She has been a journalist for two decades. Hass, 53, has written critically about both Israeli and Palestinian authorities. She has not allowed her gender, ethnicity or nationality – all hindrances in the region she reports from – to obstruct her from pursuing the truth in her reporting. In 1989, Hass quit her studies in history at Tel Aviv University and began working as a copy editor for Ha’aretz Daily. At the same time, she volunteered for Workers Hotline, a human rights group dedicated to reaching out to vulnerable workers, many of whom were Palestinian. She became acquainted with life in Gaza and grew frustrated about how poorly Israel’s occupation of Gaza was represented in the Israeli press. By 1991, Hass was writing weekly features for Ha’aretz Daily, and in 1993, she became a full-time writer for the paper. She moved to Gaza, which at the time was under direct and full Israeli occupation. Hass, now based in Ramallah, has lived in the Occupied Palestinian territories for nearly 16 years. She has been reporting on the life of Palestinians under the Israeli occupation and covering the major armed clashes and Israeli military attacks. Her goal has been to provide her readers with detailed information about Israeli policies, especially restrictions on the freedom of movement. In the course of her work, Hass has been threatened, harassed and detained. Most recently, in May 2009, she was detained by Israeli police on her return from a four-month stay in Gaza “for violating a military order” (which forbids entry into Gaza) and “for staying illegally in an enemy state.” She had also been detained in December 2008 by Israeli police on her return to Ramallah for violating the same military order. “It is my role […] to exercise the Right for Freedom of the Press, in order to supply information and to make people know.” She stated in her acceptance speech for the Lifetime Achievement Award. Hass is a pioneer for journalists, particularly women. In 2002 the Los Angeles Times reported that Hass “is the only Israeli Jew known to be living under Palestinian rule and one of a handful of Jewish reporters who still cross enemy lines for the Israeli media.” Hass moved to Gaza City in 1993, then to Ramallah in 1997, determined to provide her readers with an accurate view of the Palestinian people and the Israeli occupation. In 1997, Hass published Lishtot Mehayam shel Azza (Drinking the Sea at Gaza), which tells the history, plight and struggles of Gazans since 1948 and especially after Israel occupied Gaza in 1967. The book, first published in Hebrew, was published in English in 2000 and has also been translated into several other languages. Collections of Hass’s articles were also published in several languages: Reporting from Ramallah in 2003 and Domani Andra Peggio (Tomorrow Will Get Worse) in 2005. Hass was born June 28, 1956, in Jerusalem, Israel. 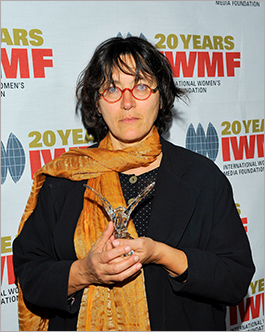 Amira Hass is the first Lifetime Achievement Award winner from Israel.